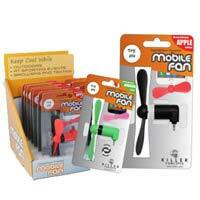 The Smartphone Powered Mobile Fan cools you off wherever and whenever you need it, from the comfort of your smartphone. A durable-and-lightweight design, the fan plugs right into your device for continuously soothing airflow. Killer Concepts fans operate using a low-power draw, allowing for several hours of use, and features Smartphone battery-protection technologies.